The Nest Bedding Easy Breather is a popular crowd pleaser for many reasons – it has a little bit of everything! A breathable and soft outer cover and combination filling that you can add/remove to your liking. There is also a trial period available to test it out. What else do you need to know about the pillow? For starters, you can choose from two different filling options and three different sizes. Read on for my full review of the memory foam version and Joe’s take on the all-natural version below. Care: Do not wash the pillow or the pillow casing. 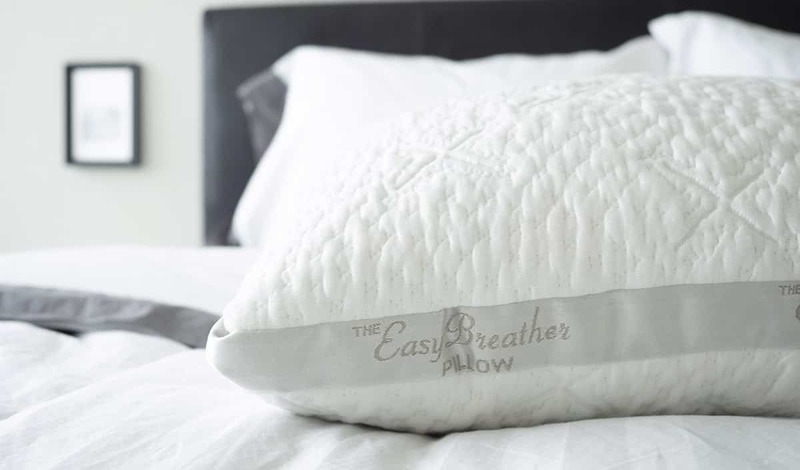 The Easy Breather (memory foam version) comes in three different sizes: Standard, Queen, and King. 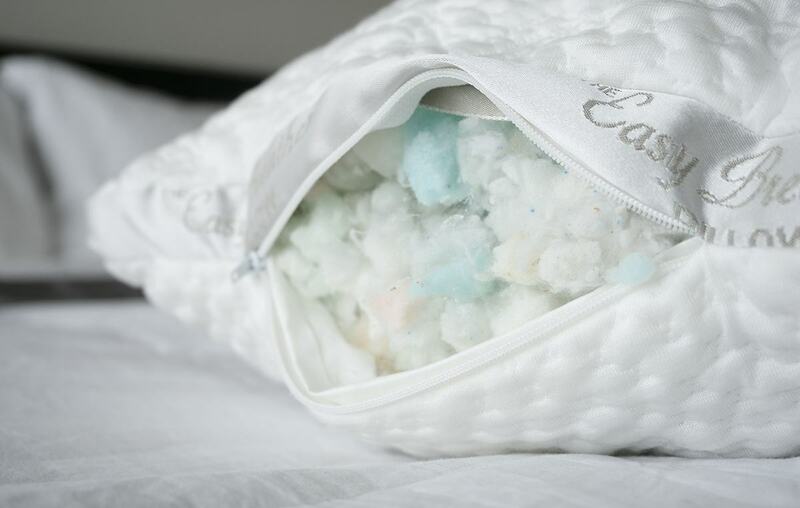 The Standard, which I reviewed, is 24″ x 16.” The inside of the pillow is a shredded blend, consisting of shredded memory foam and polyester fibers to mimic the feeling of a down pillow. The shredding is great because you have some of the responsiveness of a memory foam pillow without the firmness that can sometimes be assoacited with it. The cover is made of Tencel blended fabric, making it soft to the touch and lightweight. Also relatively easy to spot clean but it cannot be machine washed or dried. The pillow is adjustable. There is a small zipper on the side in which you can remove as much of the filling as you want – depending on your sleep position and preferred feel. The Easy Breather Pillow is available on the Nest Bedding site and Amazon, I just went ahead and bought from the Nest Bedding site. 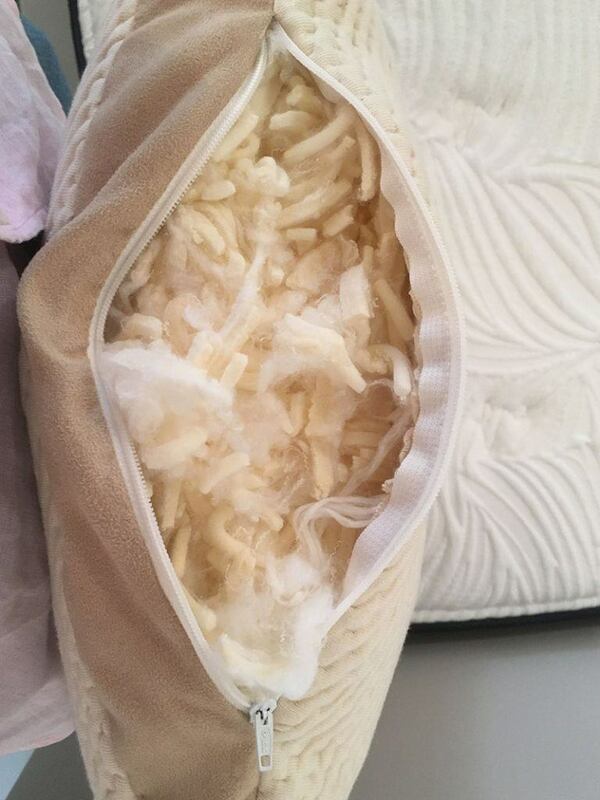 When taking it out of the package, there was a slight chemical smell (called off-gassing) from the memory foam. I ended up letting the pillow air out in my backyard overnight. If you keep it in a well-ventilated room that should do the trick, as well. There are two aspects of this pillow that I really like, the adjustable nature of it and the shredded foam/polyester fiber combination. As someone who sleeps in multiple positions (and sometimes ends up on her stomach), I liked that I had the chance to remove some of the filling and make it the perfect loft and overall firmness for me. I also really like the feeling of the filling. You get good support and cushion from the shredded foam but because it’s sort of held together with polyester fiber, it doesn’t have that bulky or clumpy feeling. You’re sort of getting the best of both qualities in the foam and the down alternative. I do wish that there was a removable cover or a way for me to wash the pillow other than to spot clean it. Because of the price, it’s definitely not a pillow you will want to buy over and over again. A waterproof pillow cover may be a good addition. Joe also reviewed the natural option of the Easy Breather pillow. 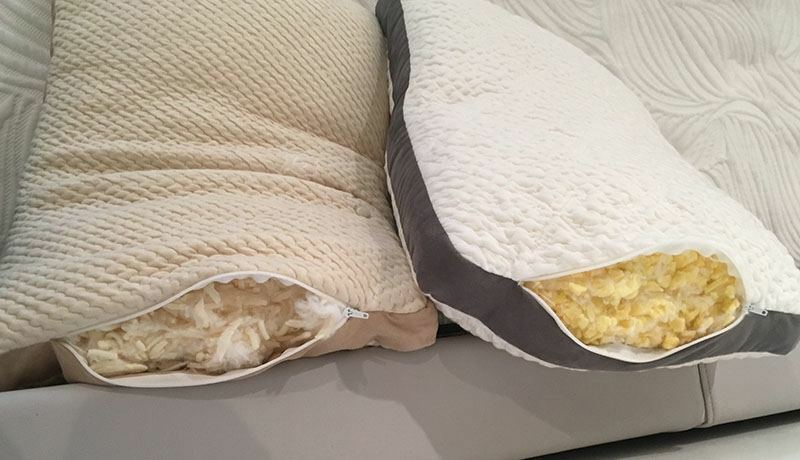 This pillow has shredded latex instead of memory foam as well as an organic cotton cover, making it a rare all-natural pillow. Both the memory foam and the latex foam pillows are great and have very similar feels. The natural pillow has a little more bounce/response to it due to the shredded pieces of latex. I love the more natural aspects of the latex pillow, especially since this will have direct contact with your head all night! That being said, I personally prefer the feel of the memory foam feel in this specific pillow. If you are intrigued by the natural latex, I would go that route – otherwise, I prefer (and have heard that others agree) the feel of the memory foam pillow. 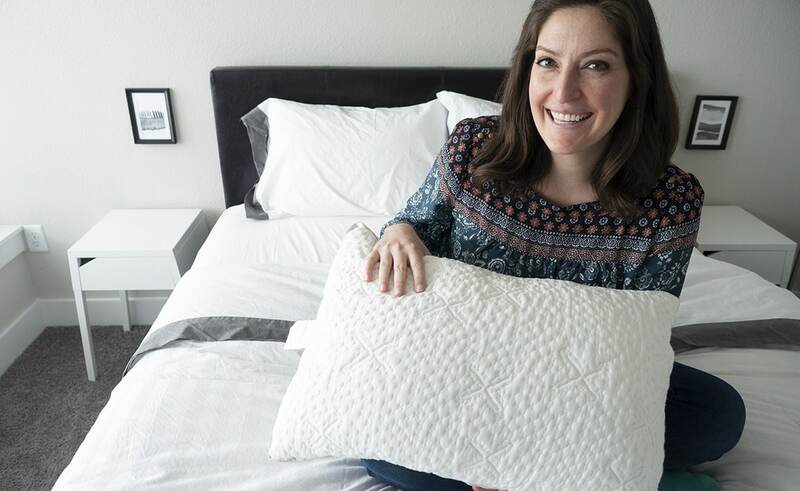 The Nest Bedding Easy Breather Pillow – both the memory foam and the natural option – is a great all-around pillow and one of our top picks. One of the features that make the memory foam version stand apart is that you can get support from the foam/down alternative combination without worrying about neck soreness. You can use it in virtually I use it when sleeping in any position, and have occasionally used it between the legs when sleeping on my side. Customer Service isn’t readily available at the site though :-(. Just calling and wait time was longer than I had, (just played music with no clue when or if someone would answer). No e-mail or chat options. All I want to know is if international shipping was at all available (across the northern border)? If not, I do have a U.S. address, but I prefer talking to someone first :-/. Hi Yvonne – I’ve only called once or twice, but usually they are quick to answer. I’d try them again – and remember they are on PST time zone. I’m not sure about their international shipping policy.